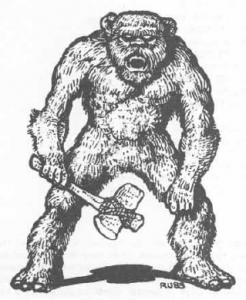 The Legendary edition of Barbarians of Lemuria doesn’t come with a lot of creatures and most of them are pretty unique and unusual. 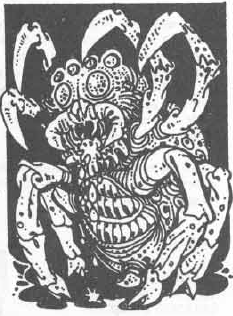 Though my own goal with B/XoL is not to recreate Basic D&D but to take inspirations from it, Dungeons & Dragons is a great source when it comes to monsters. I think between BECMI and AD&D, there are way over a thousand of them. Attributes: In the older editions of D&D, monsters don’t have any specified ability scores. However, starting with 3rd ed. they do, and the SRD is a good reference for them. 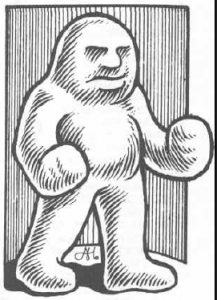 Since the Lifeblood of monsters is not affected by their Strength score, we can simply ignore Constitution, and Wisdom always had almost no relevance to anyone but cleric, so we just need the Strength, Dexterity, Intelligence, and Charisma scores and convert them to Strength, Agility, Mind, and Appeal. Lifeblood: Having used some reference creatures that are pretty similar in D&D and BoL, I think the most practical formula to calculate the Lifeblood of a creature is simply 1 HD=5 LB. This is not modified by the creatures Strength score, as it would be for NPCs. Protection: For protection, the different classes of armor can be used as reference. No meaningful protection = 0; fur or light hide = 1 (d3-1), thick hide = 2 (d6-2), scales = 3 (d6-1), thick scales = 4 (d6), extraordinary armor = 5 (d6+5). Defense: Here it’s starting to get a bit fuzzy. Based on the creatures in the Legendary Edition, there are two hrd rules that are always obeyed: Defense is never lower than Agility, and never lower than 0. Other than that, there seems no consistent rules. Some creatures have an additional increase of Defense of +1 or +2, but that increase seems mostly arbitrary, though I think it’s somewhat more common with very powerful creatures than with weaker ones. Initiative: The new Mythic Editon of BoL removes the Brawl combat ability and replaces it with Initiative. As I don’t have this edition I am not certain how it affects creature stats, but I would assume that in most cases Initative is simply identical to Agility. Attacks: Here I have not been able to find any kind of consistent rules. The bonuses to attack and the amount to damage really seems to be entirely at the discretion of the gamemaster. There is only a single creature in the Legendary Edition that has a bonus of +5, and most are between +1 and +3. However, powerful characters can easily reach a Defense score of 7 (3 agility, 3 Defense, 1 shield), which means any attack needs a +4 bonus to have any chance to hit them at all. (And even then the chance is just 3%). 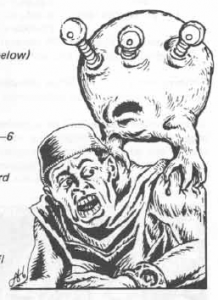 So if you’re playing a campaign where characters reach that high Defense scores, feel free to give the bigger monsters attack bonuses of +6 and higher. Damage: Damage appears to be more closely tied to the overall size and strength of the creature. 2d6 is already pretty high and only a few giant sea monsters get more than that. Since the Lifeblood of characters doesn’t really increase in BoL, I think it’s generally best not to go beyond this. If you want to make the monster nastier, make it hit more often instead. A final thought that is currently bouncing around in my head is that one could potentially increase the average amount of treasure a creature has based on it’s Lifeblood (which with these conversions would be based on Hit Dice), but I think that may start to get too much into developing a full XP system, which I don’t really want to. My main motivation to add treasure to the game is to encourage the players to face monsters and dangers without a lethal fight during adventures. The search for treasure should not be the main reason to go on the adventure in the first place. I think that should still be motivated by some kind of basic background story. When Conan goes thieving, it’s usually not to get some bags of coins, but because he is looking for item specifically. But when you’re already in the place, why not make a few little detours to grab some bags with gold too? Here’s an interesting idea I’ve been pondering all day. 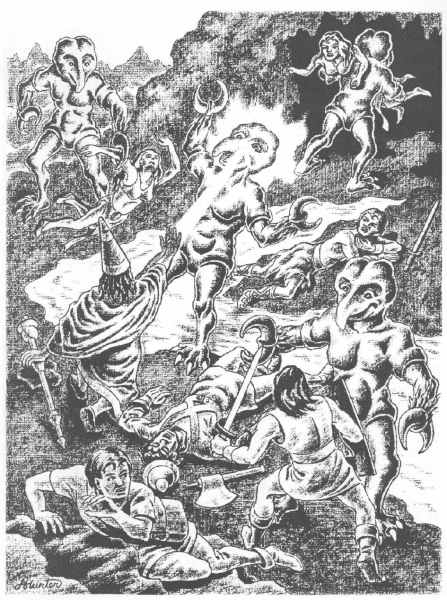 Using Barbarians of Lemuria to run an oldschool campaign in the spirit of the old Basic and Expert rules of Dungeons & Dragons. I really quite love the style of adventures that is presented by this version of D&D, but I am just really not a fan of the game at the most basic level. The entire combat system and magic system just isn’t to my liking. BoL on the other hand is pretty close to ideal to what I want out of a rules system. However, it could be argued that even Basic D&D and BoL are build on fundamentally different assumptions that make them highly incompatible with each other. The main difference is that D&D is build entirely around the assumption that the players want to get Experience Points and treasure, which make them more powerful and better equipped. On the other hand, BoL does not have any XP or treasure, and equipment is extremely limited. But I think I’ve found a neat and very effective solution to this problem. 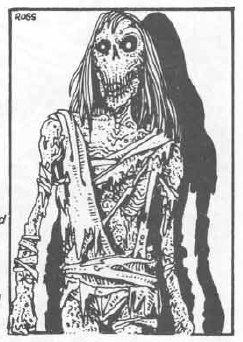 By default, characters in BoL advance by finding some treasure of indeterminate value during the adventure, and at the end the players describe how they drink and gamble it all away in true Sword & Sorcery fashion. Depending on how creative and “heroic” the players describe it, their characters get between 1 to 3 Advancement Points, which they can use to improve their characters abilities. Instead of doing this, it’s trivially simple to not give the players AP based on the story they tell, but at the rate of 1 AP for every 10 treasures they spend. 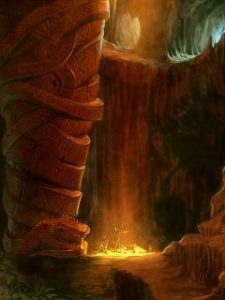 A treasure could be anything; a sack of coins, a golden idol, a big gem, some fine silverware, or whatever you want to think of. In practice it doesn’t matter. 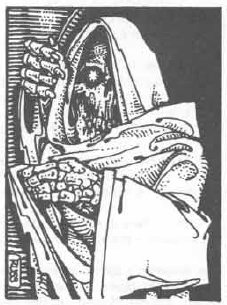 When the heroes search a vault or a fallen enemy, the GM can either describe what they find or simply say that they stuff 2 treasures into their pockets. 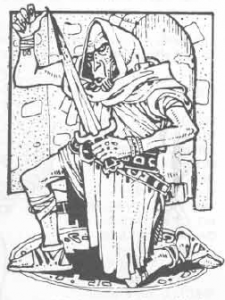 They still don’t get Advancement Points for beating an enemy like in D&D, but I think it’s really the XP for treasures that makes the old editions of D&D so fascinating. Another important element of the Basic and Expert rules is that players need to ration their supplies and have to judge how much food and treasure they can carry at the same time and how much it will slow them down between destinations in the wild. 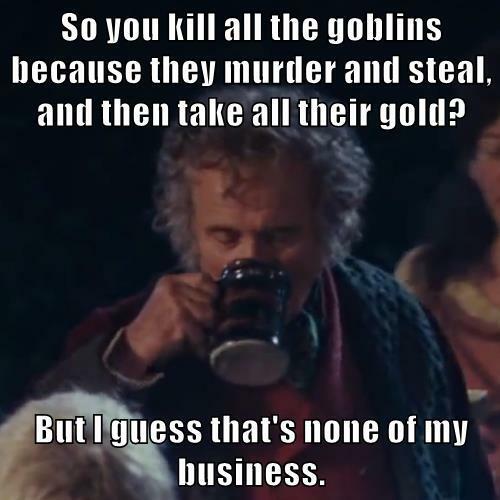 (Don’t want to find out in the middle of the dessert that you should have better taken one more skin of water instead of another bag of gold.) That will take some more thought, but I might get back to this somewhere the next days. Since this is a very new book by a small publisher, and they haven’t put the art for it online, I am not going to copy all the pictures here. But I think for this book this also won’t hurt much, as these creatures are really much more about their strange behaviors and weird abilities, and simply going by physical appearance might even create the false impression that they are rather mundane. But believe me, they are not. Or don’t believe and see for yourself what I am going to tell you about them. There are over 170 creatures in this book and I am only going to talk about my personal favorites in detail. Otherwise I’d never get through all of them. 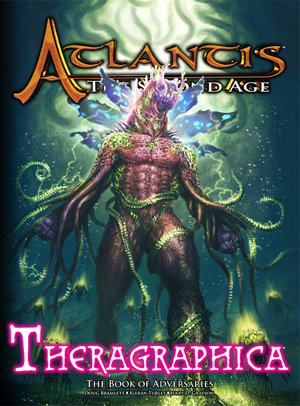 Theragraphica for Atlantis: The Second Age by Khepera Publishing, 2014; 131 pages of monsters. 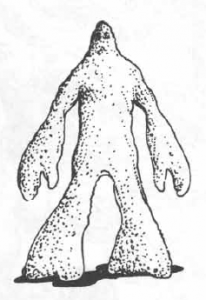 Atlantis is a relatively simple system, compared to D&D and d20 games, so the stat block for each creature is quite short. 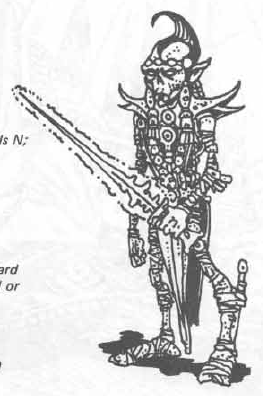 They have 14 stats plus two lines for damage and armor, and a short list of any special abilities and weaknesses. As a rules-medium game, the explanations for all special abilities are explained once in the back of the book and not elaborated on in each individual creature entry. Which at first was a bit confusing, because the creature descriptions often don’t really say what these abilities do either. But in truth, this works all really well and effectively. Aura of Fear always works the same for all creatures (with the specific strength depending on attribute scores) and is really pretty self-explanatory. The creature is scary. Those who see it close up get scared. Poison also always works the same way and a creature that attacks with its teeth obviously has poisonous bite, and one that attacks with a stinger obviously with a poisonous sting. This is information that does not need to be spelled out again every time and every GM can figure out how to describe it with a little bit of imagination. Because of that, the descriptions for each creature are really very short. Often just three or four sentences. But the free space that is left on each page is used well with a big picture of the creature, which are mostly very well done. All this combined, I feel like I am getting a lot more flavor from these monsters than from most other monsters books. My descriptions of each creature I’ll present will most likely be longer than the actual descriptions that are in the book, putting into words and talking about all the thoughts that come to my mind from these very dense entries. 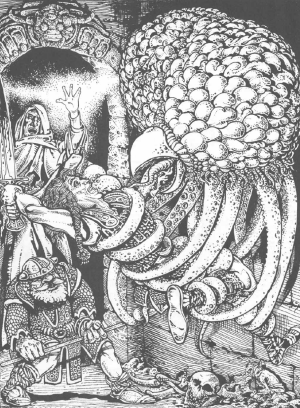 I’ve been talking with some people on the Giant in the Playground Forum for the last week about design choices in RPGs that ended up causing a lot of trouble in the long run. Simply making and adding a bad rule to a game is one thing, that happens all the time, even to the best game designers that are out there. But sometimes there are ideas that turn out to be not simply bad or not working, but have actually been sources of lots of problems for years to come. Yes, it’s been a while. Quite a while. 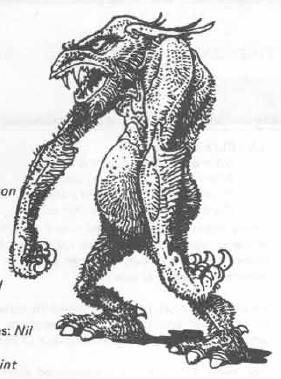 But I recently got a couple of monster books I want to share with people, and instead of going straight to those, I first want to complet this run of the Fiend Folio.